Global Travel Media » Blog Archive » On Your Marks, Get Set, Wine! On Your Marks, Get Set, Wine! If the combination of fitness and wine in a stunning location in Western Australia (WA) seems like a dream come true, then you’re going to love this. The latest Grapest 5km Run event has been announced for the picturesque Peel Region of WA, around one hour south of Perth. It will be held at the beautiful Drakesbrook Fine Wines in the town of Waroona on 17 November 2018. The Grapest 5km Run is described as ‘Australia’s best fun run with wine’. Participants build up a thirst by completing a 5km running course across a variety of terrain including grapevine rows and hills, while taking in the magnificent scenery of the winery. As a reward at the end, there’s a meandering wine tasting walk section, called the waddle, with different varieties of wine to try at each station. When the sun goes down the fun continues with live music. 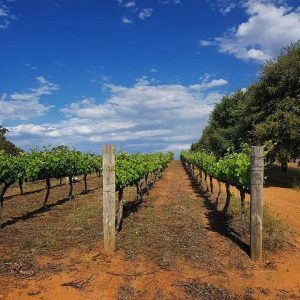 The award-winning Drakesbrook Fine Wines is nestled between the rolling hills of the Darling Scarp, next to the popular Lake Navarino resort and ski lake. The Drakesbrook River flows through the estate which is 265 meters above sea level at its highest point, providing breathtaking views to the Indian Ocean coast. Just an hour south of Perth by train or car, Mandurah and the Peel Region has a spectacular coastline, world-class natural beauty, abundance of wildlife and the cosmopolitan City of Mandurah, Western Australia’s largest and fastest growing regional city set against a backdrop of magnificent beaches and an estuary twice the size of Sydney Harbour. With new tourism experiences complementing its superb natural assets, significant redevelopment and recently being recognised as Western Australia’s 2017 Top Tourism Town, Mandurah has come of age, offering award-winning waterfront dining, aquatic adventures, world-class golf courses and plenty of places to shop. There are hiking, horse riding and mountain bike trails throughout the region and a number of options to explore the waterways including guided cruises and boat and kayak hire. Tickets for the Grapest 5km Run are available on their website now.